Ida Saki & Guillaume Queau in Lauren Adam’s Manifeste. Photo by K. Bonura Photography. I was very excited to attend the :pushing progress Showcase Series at Salvatore Capezio Theater at Peridance on May 18th and 19th. There was a wide array of talent, some of which gave outstanding performances. Manuel Vignoulle and Isaies Santamaria Perez performed Mr. Vignoulle’s Shifting Shadow. The piece began with Mr. Vignoulle standing and Mr. Perez lying of the floor with their feet touching. As the title states, Mr. Perez was a shifting shadow and mirrored every move of Mr. Vignoulle. There was a primal element to the work; the imagery created brought to mind the cave paintings of prehistory. Both the dancers were dressed in nothing more than flesh colored briefs, it stripped away anything extraneous so the focus was purely upon the statement being made. The work expressed the struggle that can possess self, the demanding need to sometimes do what is right when right is not wanted, but also, it was a portrayal of the inner self’s voice that can be heard in times of great silence….sometimes it is a whisper, sometimes it is a scream. An excellent work, both Mr. Vignoulle and Mr. Perez are superb dancers that made the piece vibrate with both emotion and intellect. Rhapsody Jones’ Liquid Sky was a slick and polished work that exhibited the perfect blend of artistry and commercialism. The work is something I would expect to see on So You Think You Can Dance. The movement is not complicated, what makes the work unique is in the phrasing and structure of the dance. There are elements of street dance but nothing obvious. I look forward to hopefully seeing more of Ms. Jones work. The Amanda Selwyn Dance Theater performed an excerpt from Ms. Selwyn’s It’s a Game. Immediately you were aware of Ms. Selwyn’s delicious lyricism of movement that flows intrinsic through her work. 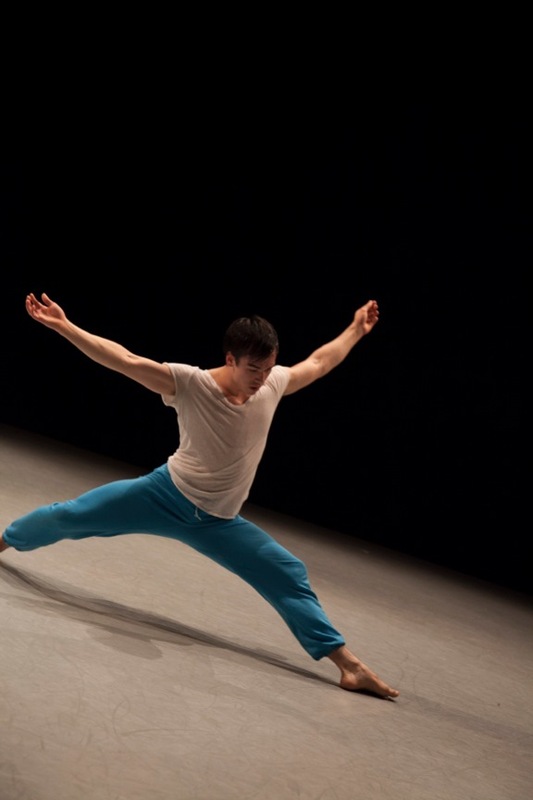 Matthew Flatley’s opening solo was moving in its intimacy. Simplistic movement is expressed through the whole body; the energy is never contained but travelling constantly, building with each phrase. The energy moves from a raised hand to the shoulder, travels through the back and implements the motion of a hip rotated forward. Leslie Scott’s duet Here, Now needs a bit more work. The transitions between shapes and phrasing need to be smoother, faster. I sensed a lack of trust between the dancers Rachel Abrams and Steph Mas. The music and the movement concept are interesting. I believe Ms. Scott is on to something with this work; it just needs more studio time. I would love to see the work after it has matured through more rehearsal and performance. Sidra Bell’s Tribute possessed a paralleled sense of light and dark. Woven within the movement was a dark romanticism. Alexandra Johnson traveled diagonally across the front of the stage with spastic movements and distorted shapes as four dancers, all in black, move behind with a lyricism and a fluidity of phrasing. The work was more movement centered as opposed to the dance theater that Ms. Bell is noted for. 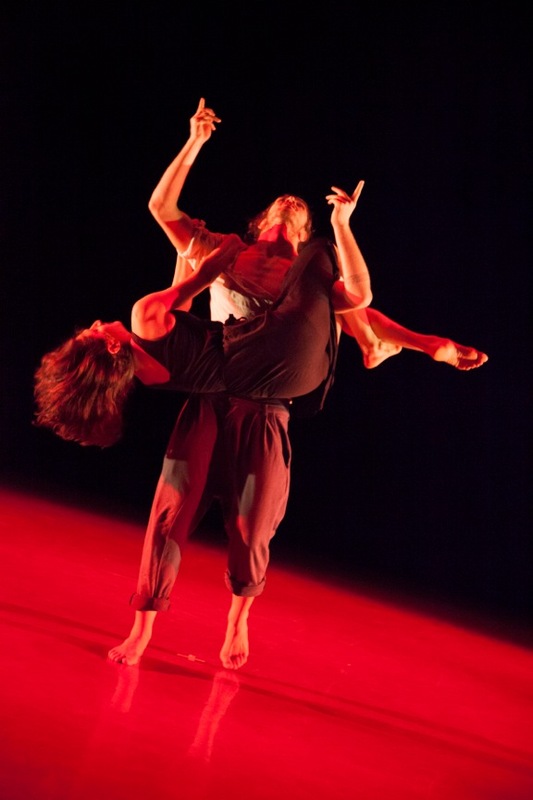 The pièce de résistance for both evenings was the performance of Ida Saki and Guillaume Queau in a duet choreographed by Lauren Adams. To say that Ms. Adams created a passionate duet is an understatement. I found myself blushing throughout the performance. Ms. Saki and Mr. Queau, both of whom dance with the Cedar Lake Contemporary Ballet, threw themselves at each other with abandonment and with such vehemence that it bordered on violence. The piece is seldom still, the dancers in constant motion. Moments of caring would quickly dissolve into co-dependence and intense emotion. Mr. Queau’s tenderness would turn from passion to rage as he would wrap his hands around Ms. Saki’s throat and drag her to the back of the stage. Ms. Saki would run across the stage and throw herself into Mr. Queau’s arms, refusing to see his violence as anything but love. It was an outstanding performance of an outstanding work …Bravo to all………. Al Blackstone choreographed a trio for Katie Drablos, Joseph Madeiros and Micheal Mindlin to Harry Connick’s The Street Where You Live. I have only seen Mr. Blackstone’s work a couple of times and his combination of athleticism and theater dance is sheer brilliance. The work was comedic and light-hearted, both original in content and execution. It was sheer excellence from beginning to end. Calen J. Kurka presented a piece that he had choreographed on the :pushing progress Contemporary Training Program, If I Swallow This. Darkness. The work had a sense of mystery about it and there was an element of unpredictability that made you sit up in your set and take notice. The dancers’ movements encompassed the use of the whole body, with the motion emanating from the torso outwards. The dancers relationship to each other was not confrontational in nature but nor did they stray away from confrontation. 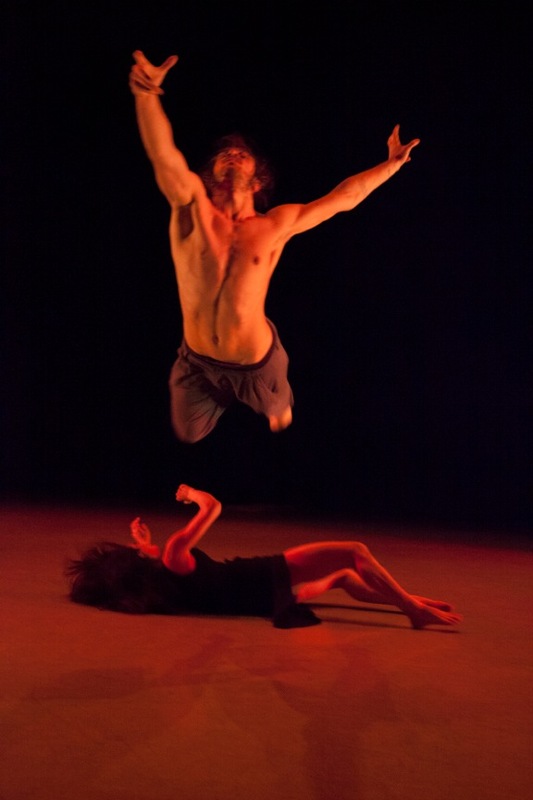 It was a work filled with movement that explored a dark awareness from within. Jason Parsons presented a trio for three men, Daniel Oliver Howerton, Corey Snide and Anthony Tiedemon. The men were dressed in an androgynous manner with loose fitting tunics and wide-legged pants. The work was so powerful because it was understated. Two men connect only to have the third pull them apart. 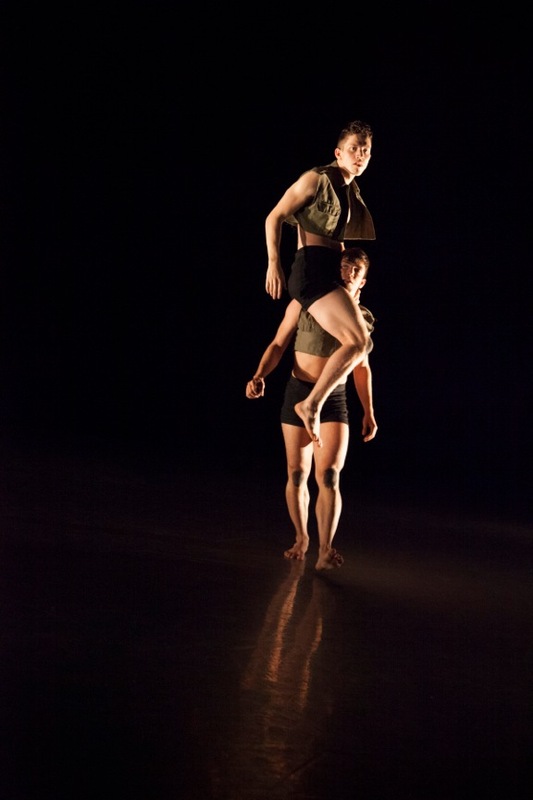 The dancers had a shared camaraderie that was both intense and subtle. David Norsworthy, a recent graduate of Juilliard performed his solo, when I start to a live recording by Annie Lennox singing Why. Initiated by the twisting and curving of the spine, his movements are executed with extreme muscle control. A leg is extended to 90 degrees, then the muscles are contracted to bring the leg in. The movement and phrasing juxtaposes from very quick to slow and expanded. Nr. 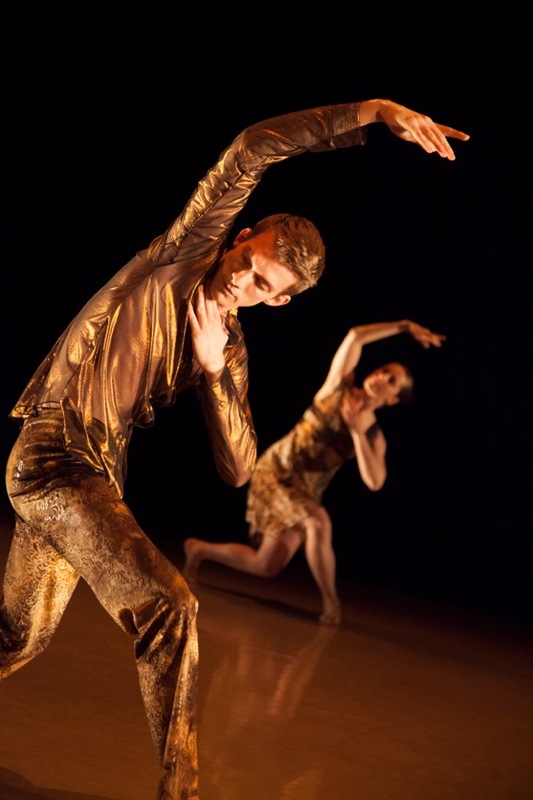 Norsworthy is a great talent both as choreographer and as dancer, he is someone to watch. Micheal Susten’s We Insist was a trio for Johanna Phieffer, Brett Hahalyak and Conon McKenzie. It’s a beautiful and intriguing work, Mr. Susten would have two dancers move in unison while the other would execute a short solo, this was a repeated theme in the beginning of the work. His dancers, excellent each of them, faced the audience and stood stationary as they moved their arms and torsos then explode into action with giant leaps. 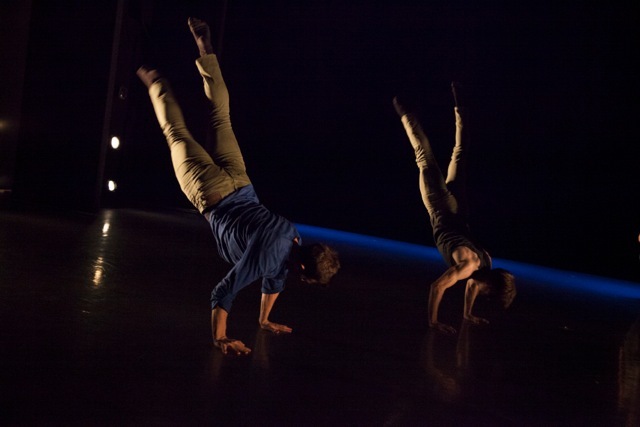 Dancer would break apart and each perform individual phrases of movements and rejoin to move in unison again. Mr. Susten is a choreographer who is unafraid to explore the dynamics of motion and emotion, his choreography is athletic with a balletic overtone. Austin Diaz and Jonathon Campbell performed an excerpt from All Good Sons, a sarcastic and cheeky, yet somewhat somber duet for two men. The work has an athleticism that keeps you focused, unsure of what is to come next, for Mr. Campbell and Mr. Diaz’ work is never predictable. A moment of violence and struggle between the two ends with each slapping their own faces as if in self admonishment. Mr. Campbell solemnly performs the sign of the cross that ends in a crotch grab and Mr. Diaz at one point turns and gives the audience the finger. Mr. Campbell and Mr. Diaz speak with the voice of their generation in an in your face and unapologetic manner. Together they form the MADboots Dance Company. Logan Epstein performed Chris Hale’s Path, set to music of Max Richter. Ms. Epstein blew this work out of the water. Her performance was crystal in its clarity; she is a dancer of deep emotion and commitment. She was an unexpected but very welcome surprise in evening filled with stellar performances and exciting choreography.